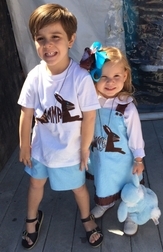 We are thrilled with how our new monogrammed, personalized bunny rabbit shirt or outfit for boys turned out! 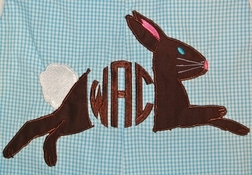 We drew/designed the bunny applique and had it made into a matching digitized file that would re-create the bunny with your son's 3 initials in the center of a John John or longall as the bunny's tummy. 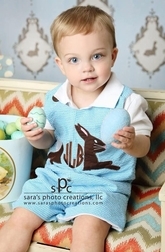 We start the John John or longall being made in turquoise seersucker gingham with 2 brown covered buttons on the shoulders We applique the front of the John John or Longall with a precious brown bunny that is meant to look real as if he is jumping off the outfit and out of any photos/portraits that you have made with your little one wearing it. 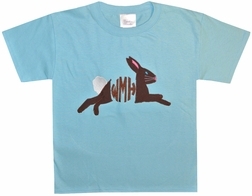 The bunny has blue eyes, gray-whiteish whiskers and pink inner portion of his ears.